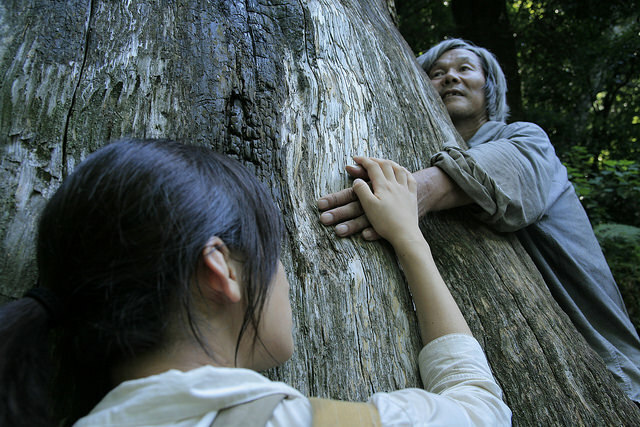 Ten years after becoming the youngest winner of the Camera d'Or, Naomi Kawase returned to Cannes and claimed the Grand Prix, for the "Mourning Forest", a film focusing on grief as experienced in Buddhism. The movie is split in two acts. The first takes place in a retirement home, where most of the patients suffer from senile dementia. The two protagonists of the story are a caregiver, Machiko, and Shigeki, a senile old man who frequently acts as a child, sometimes with bad consequences. Soon, the two of them start to connect through their grief, as Machiko is mourning her lost child and Shigeki his dead wife. Eventually, the two of them decide to take a drive in the country, but after an accident, they find themselves in a two-day journey to the forest, and in a number of dangerous situations. The trip, however, provides them both with catharsis. Naomi Kawase directs a film where the script takes the back seat, as cinematography is the central ingredient of the production. In that fashion, Hideyo Nakano's work in the department is exquisite, presenting a number of beautiful images in both the retirement home and the forest, with the green of the waving grass and of the trees dominating the images. 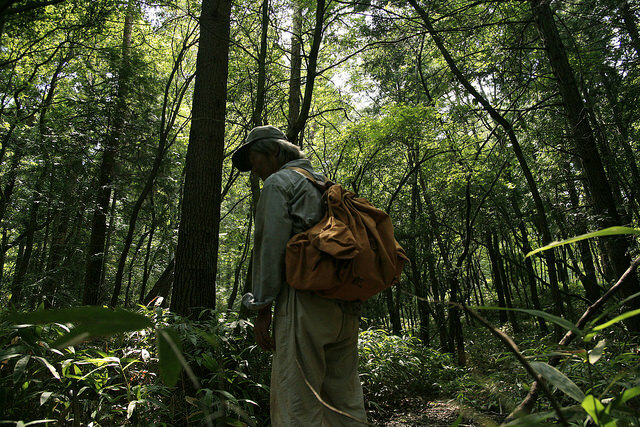 The attention to realism and the naturalism in the depiction is another key element of the cinematography, with the film occasionally looking like a documentary, particularly in the scenes in the forest. Apart from that, Kawase retains a slow pace, presenting the story gradually and in utter subtlety, with Yuji Oshige's editing Masamichi Shigeno's minimalist music implementing this approach. The core of the film is presented in a number of scenes. The theme of Buddhism is examined through the presence of a Buddhist priest in the home, with the sequence where Shigeki asks. "What can you do when you want to open up, but cannot" setting the tone for the first act, and the psychology of Machiko. The scene where her husband blames and "attacks" her for the loss of their child intensifies the previous element, in one of the strongest scenes in the film. In the forest, and through the occasional childish behaviour of Shigeko, it becomes evident that Machiko sees her child in him, with the moments where she has to save him providing a chance for closure for her. I found the scene when this element becomes apparent a bit hyperbolic, particularly due to Machiko Ono's excessive performance, but actually fits the sentiment Kawase wanted to present. His closure, however, is much more basic, in bittersweet fashion. 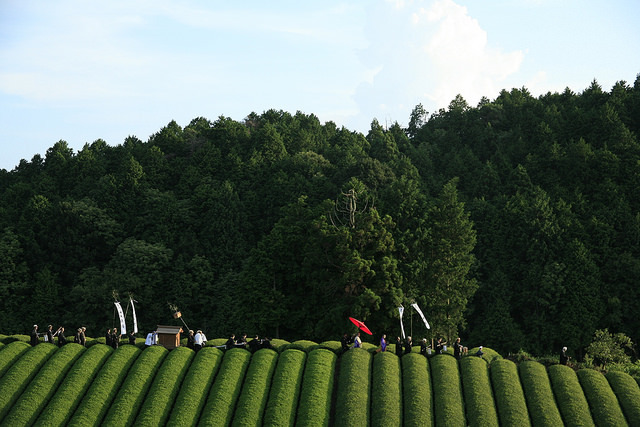 Kawase's approach to the story, where a number of incidents are left unexplained (the car accident, the wife's grave etc) can be a bit frustrating, but actually allow the audience to focus on the main theme of grief and how to overcome it, in a tactic that focuses more on the destination rather than the trip. Non-pro Shigeki Uda gives a great performance as the senile Shigeki, with the scenes where he loses his temper being the highlights of his role. Machiko One as Machiko is also quite good, particularly in the scenes where she has to communicate her feelings with her eyes and body stance. 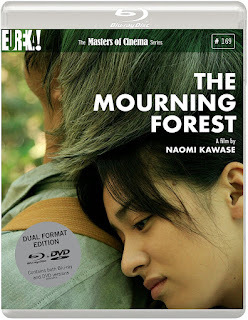 "Mourning Forest" is a difficult film to watch, due to its slow, and relatively uneventful pace, while it also demands some knowledge of Buddhism, in order to understand its concept, although the information is provided at the ending credits of the film. Art-house fans will love the film, though, as its focus on visual beauty and the meaningfulness of its central theme deems the aforementioned "flaws", practically irrelevant.